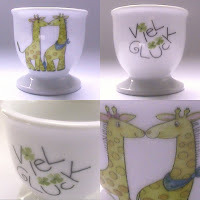 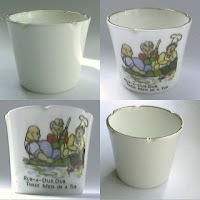 We have a very important message for you, dear egg cup collectors, egg cup lovers and readers in general: this blog is still alive! 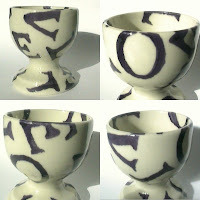 We took a little break but here we are again, with plenty of egg cups to share with you. 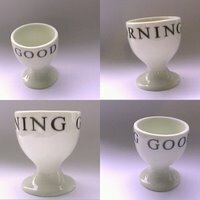 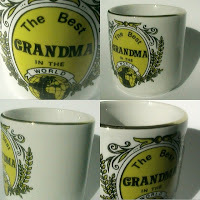 Today we take a look at some pieces communicating messages, in case another proof was need to demostrate that egg cups are much more than things to put your eggs on. 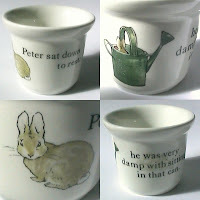 Interesting info: 1) for the delight of all Beatrix Potter fans, here is a Wedgwood Peter Rabbit fine china egg cup with the sentence "Peter sat down to rest: he was very damp with sitting in that can", marked "Wedgwood of Etruria & Barlaston, Made in England, Copyright Frederick Warne & Co" [eggcup0020]; 2) L-O-V-E Bridgewater egg cup [eggcup1136]; 3) a piece "for the best grandma in the world", marked "Made In England" [eggcup1845]; 4) "Good morning" egg cup, highly recommended for breakfasts [eggcup3186]; 5) old children egg cup with part of the lyrics of the song "Rub-a-dub, three men in a tub, and who do you think they be? 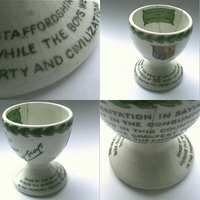 The butcher, the baker, the candlestick maker, they all jumped out of a rotten potato, turn 'em out, knaves all three" (which is really supposed to convey a message, yes) [eggcup3807]; 6) very rare 1917 egg cup paying tribute to David Lloyd George, with the inscription "Dedicated to the patriotic fowl", signed by the Staffordshire girls, which was produced in the context of the First World War [eggcup2243]; egg cup to wish good luck in German produced by Achermann, in Hinterhof (Germany) [eggcup2354].